Generally speaking, any user that can edit a document also has permissions to delete that document (this can be changed). That deleted item stays in the site’s recycle bin for 90 days. After 90 days, the only way to recover a document is to contact Microsoft to restore your SharePoint environment to an earlier date. 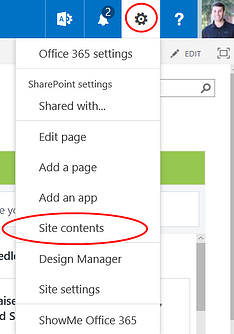 Step 1: Click the gear at the top right corner of SharePoint, and then click ‘Site Contents’. 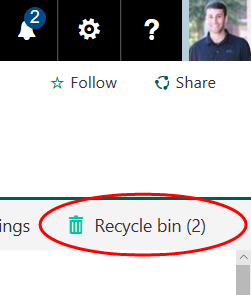 If the item has also been deleted out of the recycling bin, it's still possible for site administrators to get it back. To do this, the site administrator needs to go to the Site Settings and choose the ‘Recycle Bin’ option in the Site Collection Administration settings. If all of these options fail, you can still go directly to Microsoft. If you put in a ticket with Microsoft, they can help you restore your full SharePoint site back to where it was at a certain time and date (like before the file was deleted). But this is all they can do – they can't just pick out the individual file and send that to you. If you're constantly having to restore deleted files from SharePoint, you may want to have your site admin change your user permissions. Have questions about SharePoint or other Office 365 programs? Leave a comment below or .